This is a beyond basics yeast feed supplement. These are unique and broad-spectrum microencapsulated pro-biotic Health Products; a synergistic combination of several important natural live yeasts for the modern equine. A HIGH STRENGTH YEASTURE fortified with ß-glucan and Mannan-Oligosaccharide to enhance activity in Stimulation of immune response, and maximize absorption of ingredients you recognize. The term “probiotics” has become a health buzzword and there has been an explosion of equine supplements marketing Probiotics alone. What are they? Probiotics are beneficial bacteria which favorably alter the intestinal microflora balance, encourage feed and supplement utilization, support immune function, and support a healthy immune system. Micro-encapsulation technology is a process of enclosing the probiotics in very small sealed capsules from which the probiotic is released slowly employing an effective means of delivering the complex micro-flora to the digestive tract and hind gut where it is best utilized. With micro-encapsulation technology Smooth Run Equine’s products the key building blocks in our equine special formulas working to optimize the absorption of key ingredients. The maintenance of a healthy micro-flora balance in the horses gut promotes general health, appearance, performance and temperament. A. Microencapsulated live Saccharomyces cerevisiae and their metabolites to support gastrointestinal health and ingredeint availability: Smooth Run Equine’s pro-biotic contains several specific strains of Saccharomyces cerevisiae with high fermenting and reproductive capacity, as well as the medium these were grown in. B. Microencapsulated lactic acid-producing bacteria Lactobacillus acidophilus, L. casei, Enterococcus faecium: These beneficial bacteria inhibit the colonization of pathogens in the digestive system by producing antagonistic metabolites and/or receptor competition, known as competitive exclusion. They also produce metabolites of digestive to animals. C. Spore forming bacteria Bacillus subtilis: Bacillus subtilis spores have been shown to competitively exclude E. coli and other (bad) pathogens in the intestine. Bacillus subtilis spores have also been shown to greater the performance as well as to maintain the intestinal histology such as increased villus height. 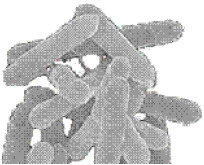 D. Comprehensive range of digestive enzymes Amylase, Protease, Lipase: To enhance the digestibility of the diet, not only to improve feed efficiency, but also to leave little substrate for (bad) pathogens in the intestine; bolstering (good) pathogenic bacterial growth in the intestine. Smooth Run Equine’s pro-biotic formula has a full spectrum, highly concentrated blend of a comprehensive range of microbial-based digestive enzymes. Feed digestion is the key to successful animal performance.